It's been almost 2 months since the release of Infinix HOT 2 , the very first Android One smartphone to arrive in Nigeria, or Africa at large. By default, the device comes with a 2200mAh Battery, not much of a Battery Juice to be candid, did people want more battery juice? 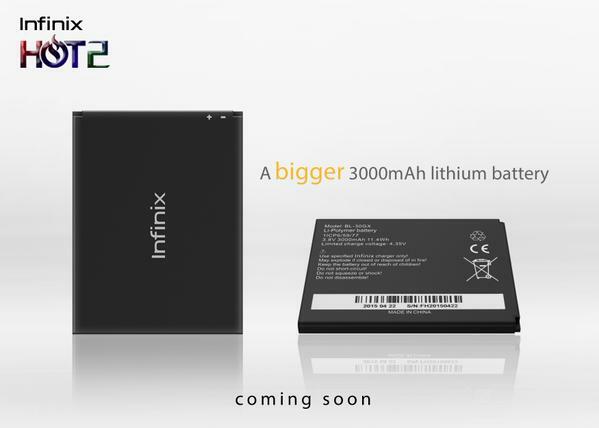 Or the Infinix Team just decided on this, however it's really Good idea by the Infinix Team as they announced a 3000mAh Battery for Infinix Hot 2 would be coming. Right now, the 2200mAh battery capacity on the Infinix Hot 2 so far is not really felt by users as the Android Lollipop OS does great at Optimizing the Battery Life. By the way, the Infinix Hot Note and Hot Note Pro with a huge 4,000mAh Battery remains the strongest in the flagship so far.